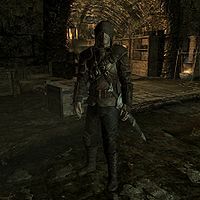 Etienne Rarnis, a Breton rogue, is found in the dungeon of the Thalmor Embassy during the quest Diplomatic Immunity, where you are required to infiltrate the embassy to discover what knowledge the Thalmor have regarding the return of the dragons. He is being interrogated when you arrive. 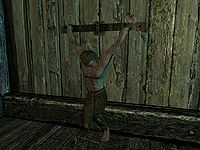 Later on, he will relocate to the Ragged Flagon cistern, where his attitude will vary depending on how he was treated - he will be grateful if he was rescued, be angry if you pretended to be a Thalmor interrogator (even if you later on rescued him), and be neutral if you ignored him. Esta página foi modificada pela última vez à(s) 22h40min de 23 de março de 2014.